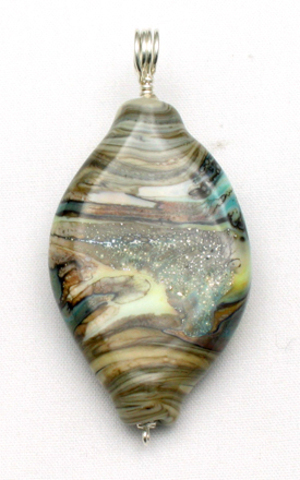 This flat, diamond shaped lampworked bead is a complex combination of striated grey "fossil", copper green, and ivory glass with accents of pure silver foil. The molten glass was manipulated with a pick and shaping paddle to create the patterning. The copper green glass provides subtle but rich accents in a field of soft color ranging from ivory to dark brown.